New Delhi (CNN) When India’s Prime Minister Narendra Modi concludes his three-day visit to Washington on Wednesday, he will likely reflect on how the relationship between the world’s two biggest democracies is becoming ever closer, a step towards fulfilling U.S. President Barack Obama’s prophesy that India and the United States would form “one of the defining partnerships” of the 21st century. At the very least, Modi deserves credit for generating an impressive amount of air miles. This week marks his fourth U.S. visit since assuming office in 2014. It is also the seventh time he has met Obama. But there is an important first this week too: Wednesday will mark the first time Modi has been invited to address a Joint Meeting of Congress in the House Chamber — an honor bestowed on just a few world leaders every year. Wednesday’s address to Congress will complete an unlikely turnaround for Modi, going from outcast to prize in just over two years. The clouds hanging over Modi’s reputation date back to 2002 when he was Chief Minister of the western state of Gujarat. More than a thousand Muslims were killed by rampaging Hindus in the final act of an ugly spate of riots. Human rights activists have long alleged that Modi was complicit; India’s courts have been unable to prove any truth to those claims. When Modi became Prime Minister the clause was rendered irrelevant. The leader of the world’s biggest democracy was simply too important. ALSO READ: Does India like Donald Trump? On his first visit to New York Modi stunned the city by drawing a crowd of twenty thousand supporters to his speech at Madison Square Gardens. Modi had arrived. He appeared at another rally in the company of ‘Wolverine’ actor Hugh Jackman. In subsequent visits he was seen with Facebook’s Mark Zuckerberg and SpaceX founder Elon Musk. Come Wednesday, the rehabilitation will be whole. Modi is now known around the world mostly for his electrifying oratory, for being decisive on foreign policy, and for talking up domestic successes – even while some of his main projects are stymied by political gridlock. 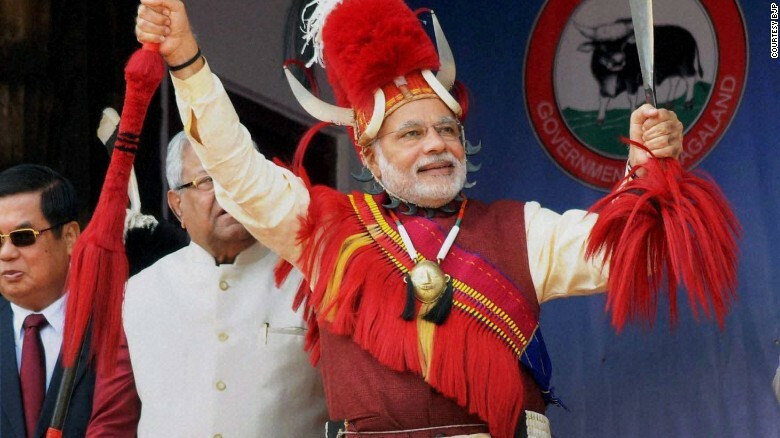 Nagaland – Indian Prime Minister Narendra Modi wears a traditional Naga warrior headgear at the Hornbill festival in Nagaland. Horbill, a bird admired greatly by locals in Nagaland, is symbolically used in these traditional tribal headgears. These headgears are considered symbols of power, position and status. It can only be worn if one has inherited or earned the right. This is largely a win-win visit for both leaders. For Obama, India could be seen as a foreign policy success, far away from the crises of Syria and Libya, the unease with Russia, or the competition with China. New Delhi has emerged as a partner in the Indian Ocean and a hedge against China’s ambitions. U.S.-India ties in defense, intelligence sharing, trade, and investment have gotten stronger. A steady stream of U.S. CEOs make their way to India every month, looking to cash in on a country that is increasingly seen as a rare growth spot in a bleak global economy. 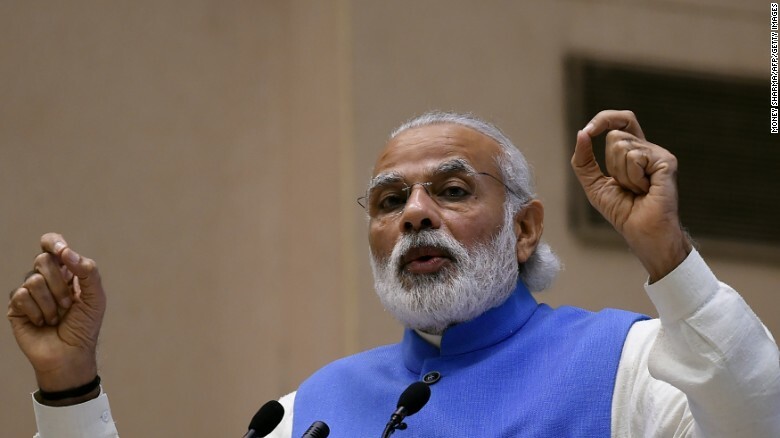 Inviting Modi to Washington is Obama’s way of sealing one part of his foreign policy legacy. As India’s Foreign Secretary S. Jaishankar put it to reporters at a briefing in New Delhi last week, there are very few world leaders Obama wants to see in his remaining months in office. Modi is clearly one of them. Modi, meanwhile, can’t get enough of the United States. Modi’s global travels get unprecedented coverage at home, but none more so than his visits to America. The Indian media has often trumpeted the so-called chemistry between the two leaders, branding it a “bromance.” In reality, Modi has been wise to be effusive in public while keeping private any lingering resentment and embarrassment from his erstwhile travel ban. For Modi, the benefits of a strong American friendship are clear: being aligned closer to Washington means he can attract more business and trade, which has always been his top priority. As the Brookings Institution’s Tanvi Madan points out, U.S.-India trade has jumped from $60 billion in 2009 to $107 billion in 2015; sales of U.S. defense equipment to India now reach $14 billion, up some 50-fold from a decade ago. The U.S. is also expected to help India join the Nuclear Suppliers Group (NSG), a club of countries trading materials for nuclear energy. Crucially for India, which has in the past flirted more with the Soviet Union than the United States, New Delhi’s friendship with Washington hasn’t cost it its own independent views. While cozying up to the White House, India has continued to forge ahead with investments in Iran, for example, such as its recent development of the Iranian port, Chabahar. As with many pow-wows between big leaders, don’t expect too much of substance to emerge. This week is more about symbolism and ironing out plans long in the works, such as military cooperation and minor shifts in energy policy. It is significant that Modi will be arriving in the U.S. from Switzerland, and traveling onwards to Mexico — both are countries that are members of the NSG, and crucial to rallying support for India’s bid to join the group. America’s support will be vital too. In return, Obama may push Modi to advance his climate change agenda following the Paris Agreement signed in 2015. While Modi is clearly no longer an outcast in Washington, he may yet have to answer some uncomfortable questions. He is expected to meet with lawmakers on Capitol Hill, some of whom have been vocal about Modi’s human rights record, including what many see as a rising climate of hostility towards Muslims in India. More publicly, a congressional commission will hold a hearing on Tuesday examining human rights in India. The session is expected to take place right as Modi and Obama meet. Modi will not have a chance to project beyond Obama just yet. This will likely be Modi’s final meeting with President Obama as the world wonders who Modi’s next counterpart will be. India and the U.S. Export-Import Bank intend to work together toward a competitive financing package. U.S. President Barack Obama and Indian Prime Minister Narendra Modi on Tuesday welcomed the start of preparatory work on six nuclear reactors in India, a key step in closing the first deal stemming from a U.S.-India civil nuclear accord struck over a decade ago. The two leaders said in a joint statement that India and the U.S. Export-Import Bank intend to work together toward a competitive financing package for the project and will work to finalize contractual agreements by June 2017. “Once completed, the project would be among the largest of its kind, fulfilling the promise of the U.S.-India civil nuclear agreement and demonstrating a shared commitment to meet India’s growing energy needs while reducing reliance on fossil fuels,” the joint statement said. Mr. Obama said he and Mr. Modi discussed how to ensure a worldwide agreement forged in Paris to curb climate change could be enacted swiftly. “We discussed how we can, as quickly as possible, bring the Paris agreement into force,” Mr. Obama told reporters . A Surrey man whom Indian officials allege is a terrorist mastermind says he is completely innocent and shocked at reports linking him to a 2007 bombing in Punjab. Hardeep Singh Nijjar told Postmedia News he’s a hard-working plumber and proud Canadian who has no time for Indian separatist politics. Nijjar, 38, said he has a meeting with a lawyer Tuesday to figure out how to respond to the allegations, which were reported in the Times of India and other newspapers on the Indian sub-continent. “This is garbage — all the allegations. I am living here 20 years, right? Look at my record. There is nothing. I am a hard worker. I own my own business in the plumbing,” Nijjar said Monday in a phone interview. Nijjar has no criminal history in B.C. India’s Central Bureau of Investigation has issued a warrant for Nijjar on charges of attempting to cause an explosion, making or keeping explosives with intent to endanger life or property, and making or possessing explosives under suspicious circumstances. All the charges were laid under India’s Terrorist Act. The warrant is also posted on Interpol’s site of suspects wanted in various jurisdictions around the world. The media reports say Nijjar was made the leader of a separatist group called the Khalistan Terror Force and was involved in a 2007 cinema bombing in Ludhiana, Punjab, that left six people dead. The reports claim he had been running firearms training at camps near Mission, B.C., for sympathizers prepared to carry out attacks in India. Punjab police said they arrested another B.C. man named Mandeep Singh Dhaliwal two weeks ago, who allegedly attended one of the camps. Officials paraded Dhaliwal before Punjabi media on Friday and said he had been in regular phone contact with Nijjar. A group called the Sikh Organization for Prisoners Welfare, based in England, is defending Dhaliwal and says the case against him is fabricated. Asked about the allegations of running a training camp, Nijjar laughed Monday. He confirmed that he has a firearms licence in Canada, but only uses it responsibly and in accordance with Canadian laws. Asked about his views on Khalistan, Nijjar said he’s too busy working to be involved in politics. The Indian reports also said officials there had contacted the Canadian government about the terror suspects. Each day, when Ali Fall heads to work, he knows he’s tempting death. The 25-year-old is not a soldier or a police officer battling urban crime, but a simple fisherman – one who spends his days hauling nets in the the waters of Gambia river in eastern Senegal, according to Agence France Presse. It might be a placid existence, were it not for an aggressive creature lurking at the water’s edge. That animal, AFP reports, is the reason Fall conducted his interview from a hospital bed, where he was wrapped in bloodied bandages. He is lucky to be alive. Many others from his village of Gouloumbou have not, as the waters “have often run red with the blood of his peers,” according to AFP. In the last decade, hippos – the most dangerous mammal in Africa, according to National Geographic – have mauled 25 fishermen to death and injured many more in Gouloumbou, elders told AFP. “Hippopotamus” is Greek for “river horse.” Unlike horses, whose instinct is to flee from danger, hippos are unpredictable, territorial and often tempestuous, making them fearsome creatures in spite of their doughy, almost cartoonish appearance. Videos showing the animals fearlessly brutalizing crocodiles are commonly posted on YouTube. Despite that appearance, they are deceptively fast, especially in water, where they become graceful swimmers. A viral YouTube video shows a hippo chasing tourists on a motorboat and briefly keeping pace. The massive herbivores are also surprisingly swift on land, clocking in at an estimated 18 to 30 mph, according to the Nature Conservancy. Reports of marauding hippos surface in countries across Africa and Asia every few years. The exact number of people killed and injured each year by hippos is not known. But regarding one notable period of destruction 16 years ago, AFP reported that rampaging herds of hippos were “spreading terror” among farmers and fishermen along the river Niger, in the west African country of the same name. Local authorities told the wire service in 2000 that the animals were attacking boatmen and were responsible for smashing or sinking about a dozen vessels. The hippos were also attacking cattle grazing near the riverbank; locals, it seemed, were defenceless. “Teams armed with machetes, clubs and burning torches have been set up to protect the rice fields, but a local trader said the strategy was ineffective because the villagers are unable to resist the charges of the ravenous animals,” AFP reported at the time. More recently, a 2014 hippo attack in the same country left 12 children and an adult dead, according to AFP. The hippo flipped a boat transporting the group across a river en route to school, though the AFP report did not clarify whether the students drowned or were mauled, either by a single hippo or by a pod. “Ultimately it was 12 students, including seven girls and five boys, who died after the attack,” Minister of Secondary Education Aichatou Oumani told AFP at the time. In Gouloumbou, village chief Abdoulaye Barro Watt has described a terrifying and treacherous situation. He told AFP that locals like Fall continue to endure the wrath of violent hippos because the river is their only source of income. Even so, Gouloumbou villagers told AFP, venturing into the waters is a last resort, in part because their ethnic group’s traditional fishing boat – a wooden skiff known as a “pirogue” – provides little protection from an angry hippo. Moussa Bocar Gueye said he hasn’t been fishing in three weeks. But killing hippos is not an option, AFP reports, because they’re a protected species in Senegal. Fishermen aren’t the only ones vulnerable to attack, according to AFP. Villagers rely on the tributary to wash their clothes and bathe, but they do so warily. “We don’t have a well or any taps,” she added. Djibril Signate, Senegal’s national director of inland fishing, told the news service that the government plans to provide fishermen with 20 metal pirogues – with motors – to provide more safety during an attack. Despite the new boats and the fishing enclosure, Fall has had enough of the hippos lurking in the river. A Surrey man is accused of running a “terror camp” near Mission that’s plotting attacks in the Punjab, according to an India news report. According to the report, Nijjar, a Canadian citizen, has lived in Surrey since 1995. He is wanted in India in connection with a blast at a cinema in Ludhiana in the Punjab province, where six people died in 2007. The report alleges Nijjar has been training at least four Sikh youths on how to use AK-47s for the purpose of carrying out attacks in India. The training took place “in a (rifle) range near Mission where they were made to fire for four hours daily,” said the report. One of the trainees, Mandeep Singh, was arrested two weeks ago, said the Times. Singh arrived in India in January from Canada and is accused of being involved in a terrorist plot. The report claims Singh was on a reconnaissance mission and that Nijjar was to arrange weapons from Pakistan. The Times said India intelligence agencies have alerted Canadian authorities to the alleged camp, and have already submitted an application seeking Nijjar’s extradition. Global Affairs Canada wasn’t available for comment late Sunday. This isn’t the first time India authorities have requested Canada track Nijjar. In 2015, India police requested RCMP track his whereabouts after he was suspected of a plot to transport ammunition by paraglider over the Pakistan-India border. That plan was foiled after the arrest of Jagtar Tara, described as the former chief of the KTF. More than two months after the body of an NRI, who was into property dealing in the district, was found in Sawara village in Kharar on March 16 with multiple stab wounds, the police have booked his wife Pawandeep Kaur (35) for murder and arrested four men who had planned the crime, including the contract killer. Police claim that Pawandeep, a mother of two staying in Toronto, had an estranged relationship with her husband, Jaskaran Singh (38) and also wanted to grab his property. Police also claim she was also having an affair with two of the men involved in the murder. She had paid Rs 2.75 lakh to the killers and had promised another Rs 25 lakh. The accused have been identified as Lakhbir Singh (32), the contract killer; Davinder Singh alias Prince (25), Bhawanpreet Bhangu (25) and Gurpreet Singh alias Soni (25). Davinder holds a bachelor’s degree in computer applications (BCA) and worked with the Nawanshahr district transport office, Bhawanpreet Bhangu from Ropar is also a BCA; Gurpreet is a BCA and is a bus conductor at Ropar. On the day of the murder, contract killer Lakhbir approached Jaskaran as a property buyer and the duo decided to go take a round. At a vacant plot near the Government Middle School, Jaskaran was stabbed repeatedly with a knife and the body was dumped in the fields. His body was later spotted around 4am by a woman passerby. “Pawandeep conspired to kill Jaskaran as they had an estranged relationship and she also wanted his property. The couple jointly owns a house in Toronto where she is presently living,” said SAS Nagar senior superintendent of police (SSP) Gurpreet Singh Bhullar. He added that Pawandeep was having an affair with Gurpreet Singh alias Soni since 2013 and later also developed intimate relations with Bhangu, who introduced her to contract killer Lakhbir Singh. Bhullar added that since the murder appeared to be the work of a professional, from Day 1, the police did suspect the hand of a family member in crime and had been monitoring Pawandeep. “Pawandeep transferred Rs 2 lakh to Bhangu through Western Union that alerted us. Another Rs 75,000 was sent directly to the account of contract killer Lakhbir,” the SPP added. After the brutal murder, Lakhbir fled from the district to Delhi in the victim’s Swift Dzire that has been recovered from his possession. He had fitted a fake registration plate and kept on using the car. In a brazen show of overconfidence, Pawandeep, along with her children, had even visited the Swara village to attend the last rites of Jaskaran. Even as the police investigation is on, she had returned to Canada on the plea that her children had their exams. In fact, the unsuspecting father of Jaskaran had requested the police to allow her to leave. “We did suspect her, but did not have evidence to nail her. She was thus allowed to leave. We will approach the Canadian embassy for her arrest,” the SSP added. Lakhbir is a double murder convict serving life term and came out on parole in 2012 from the Patiala Jail. He is a proclaimed offender and figures as accused in four other cases. The Prime Minister, Justin Trudeau, today delivered a formal statement of apology in the House of Commons for the Komagata Maru incident. On May 23, 1914, a steamship arrived in Vancouver carrying 376 passengers who had hopes for a new life in Canada. After a long journey from India, the majority of the passengers – who were of Sikh, Muslim, and Hindu origin – were denied entry into Canada due to the laws in existence at the time. Today, the Prime Minister delivered a formal apology in front of descendants of those directly affected by the incident. He emphasized that Canada’s rich diversity is a source of strength for our country and reaffirmed the government’s commitment to upholding the values – including multiculturalism – enshrined in the Canadian Charter of Rights and Freedoms. “The Komagata Maru incident is a stain on Canada’s past. But the history of our country is one in which we constantly challenge ourselves, and each other, to extend our personal definitions of who is a Canadian. We have learned, and will continue to learn, from the mistakes of our past. 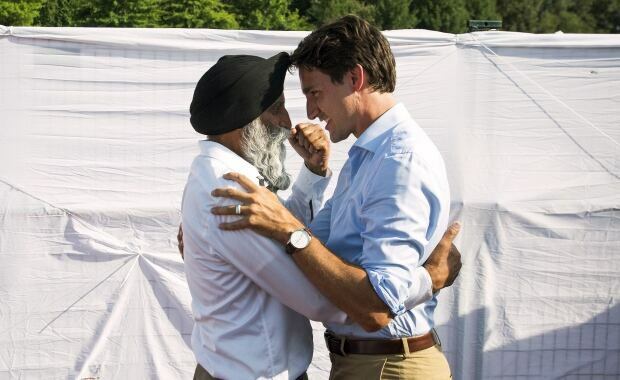 We must make sure to never repeat them,” said Prime Minister Justin Trudeau in the House of Commons while delivering the formal apology for the Komagata Maru incident. Ottawa, Ontario: Canada and Europe enjoy a strong partnership and shared values, and today the Honourable Chrystia Freeland, Minister of International Trade, was pleased to welcome to Ottawa Martin Schulz, President of the European Parliament. After meeting in Brussels last month, the two continued their discussion today on the next steps toward implementing Canada and the EU’s landmark trade agreement, the Comprehensive Economic and Trade Agreement (CETA). “Canada is a trading nation. Free trade agreements do not simply connect us to the rest of the world, they also guide our economic growth. CETA is a gold-standard agreement that will bring great benefits to both Canadians and Europeans. We are firmly committed to having CETA enter into force as early as possible so Canadians and Europeans can take full advantage of its benefits, says Hon. Chrystia Freeland, P.C., M.P., Minister of International Trade. The two agree that CETA sets the standard in terms of free, fair and progressive trade and that it will create tremendous opportunities on both sides of the Atlantic. Canada and the EU are committed to signing the agreement in 2016 for entry into force in 2017. Posted on May 18, 2016 Categories B.C., Canada, News, WorldTags Hon. Chrystia Freeland, M.P., Minister of International Trade. Canada, P.C. It’s an apology more than a century in the making. 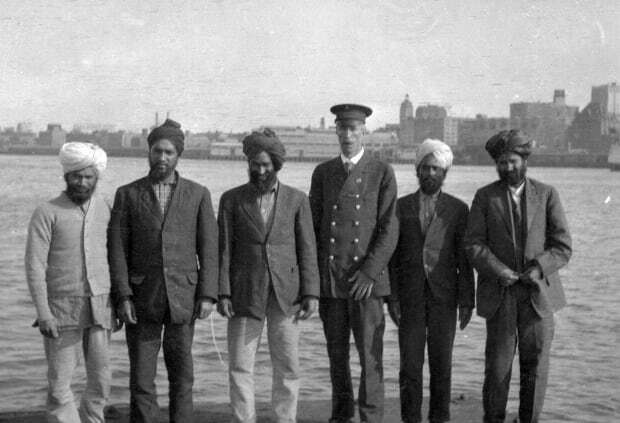 Nearly 102 years after the Komagata Maru sailed into Vancouver, Prime Minister Justin Trudeau has offered a full apology in the House of Commons for the government of the day’s decision to turn away the ship, which was carrying hundreds of South Asian immigrants, most of whom were Sikhs. The Komagata Maru arrived on Canada’s West Coast on May 23, 1914, anchoring in Vancouver’s Coal Harbour. Nearly all of the 376 passengers were denied entry and the ship sat in the harbour for two months. It was ultimately forced to return to India and was met by British soldiers. Twenty passengers were killed and others jailed following an ensuing riot. “The passengers of the Komagata Maru, like millions of immigrants to Canada since, were seeking refuge and better lives for their families. With so much to contribute to their new home, they chose Canada and we failed them utterly,” Trudeau said last month, announcing the formal apology. The Komagata Maru was a Japanese steamship chartered by wealthy Sikh businessman, Gurdit Singh, who was then living in Hong Kong. Its passage was a direct challenge to Canada’s immigration rules, which had grown increasingly strict — and discriminatory — at the turn of the century. Canada needed immigrants to cultivate western farmland but preferred those from the U.S, Britain or northern Europe. India had been a British colony for almost 200 years at this point, and Singh believed British citizens should be able to freely visit any country in the Commonwealth. The steamship departed Hong Kong on April 4, 1914, making stops in Shanghai and Japan. Previously used to transport coal, the Komagata Maru had been transformed for the long journey. 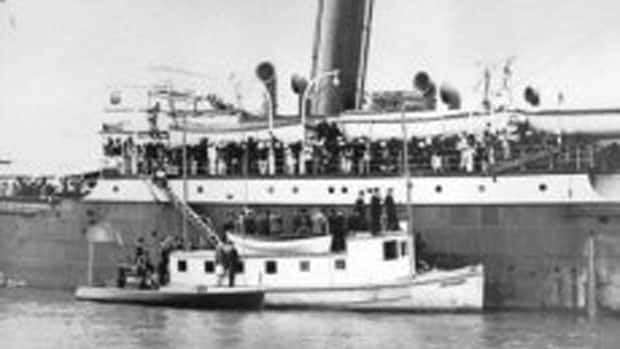 In Vancouver, the Komagata Maru was immediately greeted by immigration officials who refused to let its passengers disembark. Twenty people determined to be returning residents were eventually permitted entry, but no one else stepped foot off the boat. By the early 1900s, British Columbia was home to about 2,000 Indians, mainly Punjabi Sikhs, who had come for work. They were some of the first Asian immigrants. Canada instituted the Chinese Immigration Act in 1885, which included a head tax, to try to limit arrivals from the East Asian country. By 1907, race riots and “anti-Asiatic” parades were taking place, spurred by fears that immigration would allow Asia’s large population to overrun Canada’s West Coast. The Komagata Maru sits in Vancouver’s Coal Harbour in 1914. The ship became a spectacle for locals during its two-month stay at the waterfront. In response, Canada passed the Continuous Passage Act in 1908, requiring all immigrants to arrive directly from their point of origin, with no stops in between — a near-impossible task for those travelling from South Asia. Immigrants from this region also needed to arrive with $200 in landing money, not dissimilar to rules still in place today intended to ensure new arrivals can support themselves, but fees back then varied from one population to the next. In chartering the Komagata Maru, Singh was testing these new rules, though he may not have shared his strategy with his passengers. And as British subjects, they didn’t believe they were subject to the $200 landing fee. These laws remained on the books until 1947. During the two months the Komagata Maru sat in the harbour, the ship became a spectacle, with near-daily newspaper reports of developments and crowds of hundreds gathering at the waterfront to gawk. The Komagata Maru was formally ordered out in July. On the 19th, 125 Vancouver police officers and 35 special immigration agents attempted to board the vessel but were beaten back. Four days later, on July 23, under the guns of the naval cruiser HMCS Rainbow, the Komagata Maru was escorted out to sea and began the journey to Calcutta. Johnston began researching his book in the late 1970s, only a few years after Canada opened up its immigration policies, and says very few people had heard of the Komagata Maru at that time. But Canada’s South Asian population now sits at 1.6 million, according to the 2011 Census, with India being the third most-common source country for recent immigrants. The Prof. Mohan Singh Memorial Foundation, founded in 1990, has been lobbying for an apology for nearly 25 years, working with local, provincial and federal politicians. In 1988, Prime Minister Brian Mulroney formally apologized to those sent to Japanese internment camps in the 1940s, and Prime Minister Stephen Harper issued official apologies for the Chinese head tax in 2006 and to residential school survivors in 2008. The B.C. government formally apologized for the Komagata Maru incident in May 2008 and a monument was unveiled on Vancouver’s seawall in 2012, funded by the federal government. 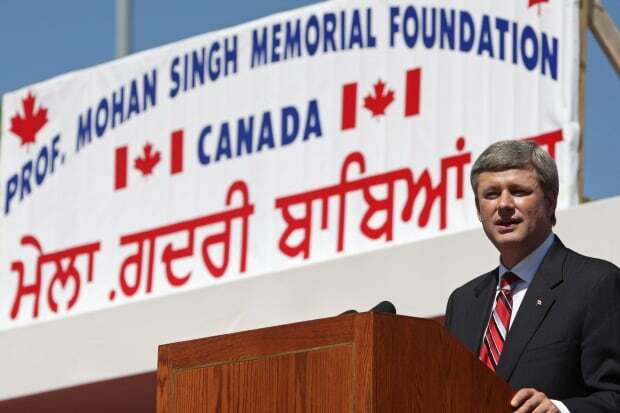 But Harper stopped short of a formal apology in August 2008, when he instead apologized at a Sikh gathering of 8,000 in Surrey, B.C., home of the country’s largest Indo-Canadian population. Many in attendance immediately rejected the apology, saying it needed to be done on the floor of the House of Commons. The Prof. Mohan Singh Memorial Foundation, which organized Harper’s appearance, had made it “very clear” only a formal apology would be acceptable, Thind says. The Liberals have been pushing for a formal apology for years and Trudeau made pre-election promises to do so in both 2014 and 2015. Thind says his organization expects tomorrow to be a “huge celebration” with 500 people in attendance. The group, meanwhile, will continue to push for the Komagata Maru story to be included in Canadian curricula.